What a reassuring promise! Philippians 4:19 tells us that God will supply our every need, but notice that this verse comes after discussion of the support that the Philippians gave to Paul. (Philippians 4:15-19) We cannot take this verse out of the context of the rest of the Bible; we must look at it in light of other scriptures. Throughout the Bible we are told to give generously. The ancient wisdom of Proverbs tells us that those who are generous will be blessed, but those who withhold their wealth will come to poverty. (Proverbs 11:24-25, Proverbs 22:9) In Malachi 3:10 we are encouraged to bring the whole tithe into God’s house. This is one circumstance in which God invites us to test Him, and He promises to pour out a blessing upon us from the windows of heaven. Some people believe, or perhaps just use as an excuse, that this was an Old Testament law, and no longer applies to those of us living under the grace of the New Testament. 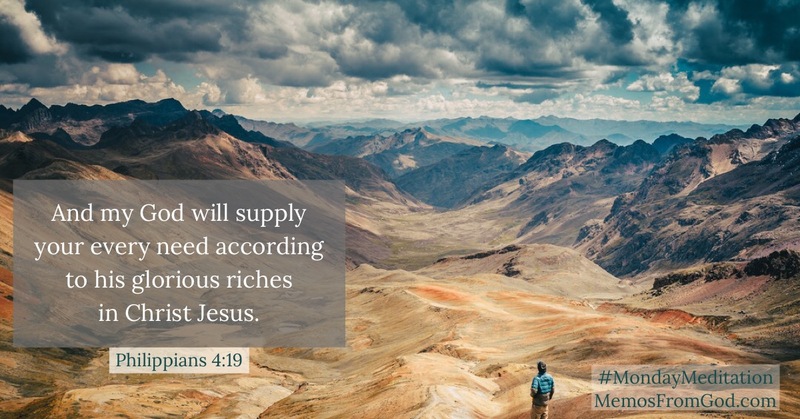 However, this is essentially the same thing that Paul says in Philippians 4:19, God will supply your need according to His riches. Luke echoes this in Luke 6:38: Give and it will be given to you, good measure, pressed down, shaken together and running over. I always think of baking when I read this verse. When you fill a measuring cup with flour, then press it down and shake the cup a bit, it creates room for more. This is the way that God gives; He presses down the blessings, shakes the air bubbles out and keeps on giving past the point where there is room to hold any more. But our giving has to come first. When Paul thanked the Philippians for giving to him, he emphasized that it was not because he needed more (though it certainly was a blessing to him), but so that they would be acknowledged for their gift. Their generosity was an indication of their hearts toward God, as they were really giving to Him. (Matthew 25:40) God is pleased with such sacrifice (Hebrews 13:16), and He loves a cheerful giver. (II Corinthians 9:6-8) If you give generously, you will be blessed, and both the giver and receiver will experience joy in the gift. Paul starts this section of the chapter (Philippians 4:10-14) with a familiar theme: joy! He tells the Philippians that he has great joy in the Lord because they have again showed their concern for him. He is thankful for what they have done to provide for his needs, but his joy does not come from their provision. He is grateful for their gift, but he wants to be clear that he is not asking for more. He has learned to be content in any circumstance, whether he has little and is hungry or he has food in abundance. The Greek word that is translated as ‘learned’ has the connotation of a long, hard lesson. It wasn’t just a matter of hearing someone say that Christ’s grace is sufficient, (II Corinthians 12:9) as many of us have. I have often heard that verse used as a platitude when someone is facing a trial, but Paul learned this from experience. You may remember from the post on April 20, 2011 that Paul had had more than his fair share of trials, and yet he had learned the secret of contentment. We all should be so fortunate. Sometimes I think that we don’t appreciate the suffering that we have to endure. I know I often wish that things were easier, but perhaps we (I) should look at what we can gain from our suffering rather than work so hard to avoid it. Job learned that lesson in the Old Testament. He had lost everything, even his wife’s support, but Job continued to bless the Lord despite his circumstances. (Job 1:21) Likewise, Paul rejoiced despite his circumstances because he knew that he was in the will of God. Whatever came his way, he knew that he would be able to get through it because God was on his side. Philippians 4:13 is another verse that is used frequently to encourage people. It is usually quoted by itself without the verses around it for context. Yes, it’s true that with Christ’s strength we can do anything, but the context tells us that this is Paul’s secret of contentment. As long as he is in the will of God, God will provide the strength that he needs to face any situation. Nevertheless, the Philippians were right to support him in whatever way they could. Sometimes the way God provides His strength is through his people, by allowing us to be His hands and feet. It is not that God could not do it without us, but He is allowing us to have a part in the blessing of helping others. We, too, could be the reason for another’s joy. On Friday (April 22, 2011) we looked at the simple solution to living a stress-free life. I say simple because there are not many steps to follow, and none of them are complicated to understand, but I, as much as anyone else, know that it is not easy. It is a challenge for humans to stop focusing on themselves and start focusing on God. That is in fact what we need to do. Philippians 4:8-9 gives us further direction on how to do it. I’m sure you’ve probably heard of the power of positive thinking. Psychologists and business experts alike promote the concept for personal and economic success, but the idea isn’t new. Paul suggested it thousands of years ago. It is a well established fact that if you dwell on negative things—your problems, weaknesses or shortcomings—things will only go from bad to worse. I’ve proved it myself. When I was a student, I used to have terrible exam anxiety; I always feared that I wouldn’t do well enough, that I wasn’t good enough. Finally I tried positive thinking: I can do this. I know the material. I am prepared. I can’t say that I ever became fond of doing exams, but I can say that I did better when I went in with a positive attitude. Paul’s advice is to think about the positive--the good, noble, pure and lovely. It is very similar to his advice in Philippians 4:6-7. There he said that when you feel anxious, you should change direction by praying and thanking God. Now he expands on that, and says when you find yourself thinking negatively, you should stop yourself and start thinking about the excellent and praiseworthy things. You can control your thoughts. You first need to recognize when they need changing and then make a conscious effort to do so. Think about Jesus and all that He has done for you. Think about the wonders of creation that tell of the power of God. Read the book of Philippians. 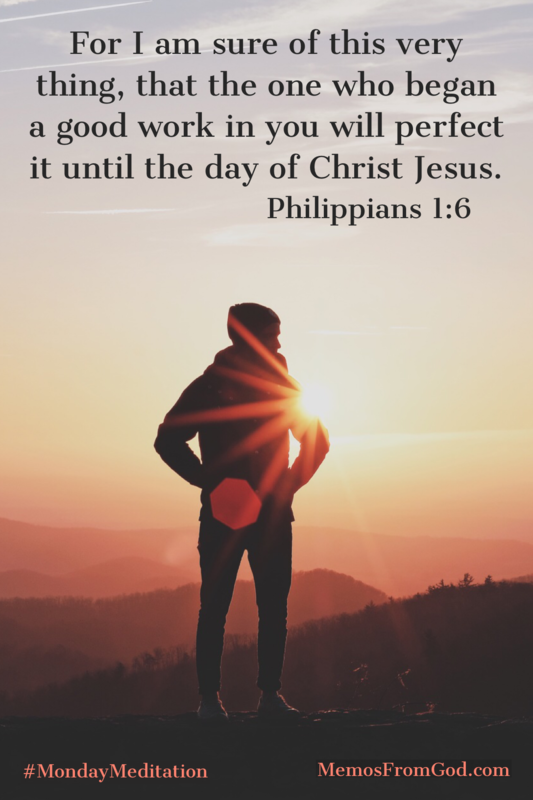 Realize from Philippians 1:6 that God is in the process of perfecting us. He has a purpose for us, and our trials have a purpose. (Philippians 1:12) Paul in all his distresses was able to keep his eye on the goal, and he encourages us to do the same. (Philippians 3:13-14) Above all, remember the hope of eternity (Philippians 3:20-21), and that our struggles here are temporary. Paul again accompanies his instructions with a promise. If we follow his advice and example, change our outlook and attitude, and then let our actions match our thoughts, the God of peace will be with us. one thousand gifts is available (and on sale) from Dayspring. If you are interested click the photo.